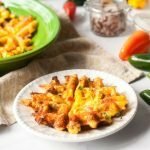 These low carb jalapeño popper waffles can be a great snack, lunch or even breakfast! They are savory waffles with a bit of a kick and only take a few minutes to make. 1.1g net carbs each. Clean the ribs and seeds out of the jalapeño and then finely dice both peppers. Tor rice the cauliflower, add florets to a food processor and pulse a few times until they resemble rice grains. In a bowl, beat the eggs and then add the rest of the ingredients. Heat up waffle iron. If you manufacturers directions suggests greasing first, please grease before cooking each waffle. Add a bit of waffle mixture to your waffle iron in the center and cook as you would any other waffle. Continue until mixture is gone. This made 6 small waffles for me. Eat immediately or if freezing, reheat in the microwave for 30 to 60 seconds. They will not be crunchy when reheating but they will taste delicious anyway.